“Les Mis.” Short for Les Miserables, (French for The Miserable Ones), these two words have provoked such excited reactions from all my friends. The film’s poster of a pale little girl with ethereal blue eyes is all over my Instagram. Statuses about how you should bring a tissue box to the theaters clog up my Facebook feed. Twitter hashtags of #Lesmis are trending quickly. Adapted from the novel by Victor Hugo and the musical, Les Mis is about a man named Jean Valjean (Hugh Jackman) who is enslaved for nineteen years because he stole a loaf of bread. However, he breaks his parole and tries to start an honest life under a new identity while escaping the clutches of Inspector Javert (Russell Crowe), who considers his moral and civil duties to be the same. When Valjean meets Fantine (Anne Hathaway), a mother looking for work who turns to prostitution, he vows to take care of her daughter Cossette (the poster girl). This all takes place during a boiling post-revolution period in which the poor are revolting against the king. Other characters make their way into this musical as well, each of their stories intertwined as their voices rise above the hardships and the pain. I went to the theaters with little to no background knowledge of the musical or the novel. As a result, it was a bit hard to follow the story. It was also shocking to see that happy endings were rare in this movie. 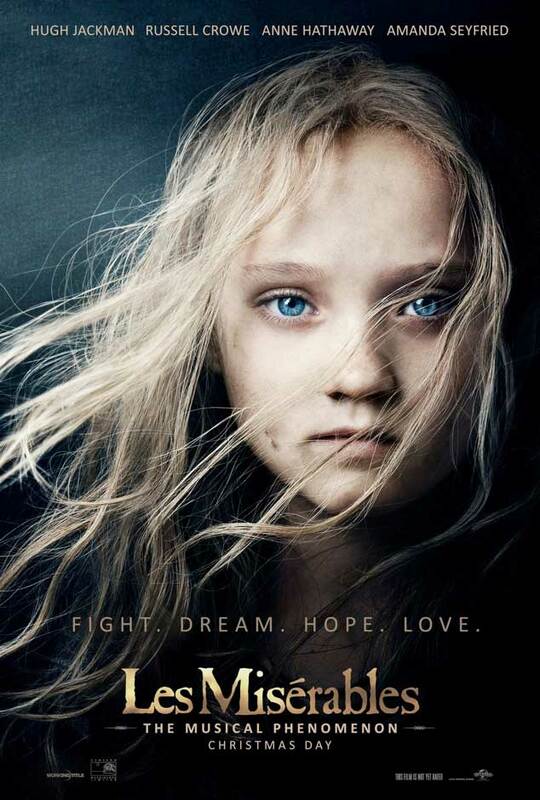 However, Les Mis is emotionally heart wrenching and the story is rich with themes of redemption, mercy, and forgiveness. Valjean is overcome by the love and mercy a Bishop shows him, and turns his life to God. The movie’s sentiments boil down to its music – sweet, poignant, beautifully written songs. The score’s recurring motifs are grand and perfect for the movie. It’s a first for a movie of this scope that the cast sang live, allowing them to truly “be in the moment”. Two performances that stood out to me the most were ‪Aaron Tveit’s portrayal of the revolution leader, Enjolras, and Samantha Barks’ Eponine, the daughter of a lowly money-hungry couple. Although not all the actors are pitch-perfect and Hugh Jackman’s first songs sounded a bit rough, director Tom Hooper could have sweetened the vocals, but he chose not to. And that is one of the most important elements of this movie – even though it feels rough and gritty, it’s certainly raw and real. Anne Hathaway’s “I Dreamed a Dream” is not just beautiful but it was sung wholeheartedly from the depths of a broken woman, who had given her everything to save her child. In fact, her performance along with the emotional depth makes it a cut higher than Susan Boyle’s take. Samantha Barks’ “On My Own” is moving and remarkably sung, the poetic lyrics speaking true. Barks steals the show and I am so relieved that Taylor Swift did not get the role. Les Mis has a fantastic story and tells it through fantastic songs. Parents should be aware that it’s rated PG-13 for a reason (prostitution, bar scenes, war). Although I can’t say if it lives up to the musical (having never watched it), all my theater-savvy friends say it does. For those who love musicals, you’ll probably be swept away breathless for 2 hours and 37 minutes – however, for those of you with limited attention spans looking for heart-racing action movies, this is probably not the flick for you. Viewers, be prepared to have your heartstrings tugged. Oh, and don’t forget to bring a box of tissues.